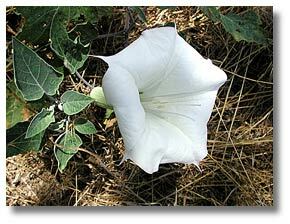 All parts of all datura plants are poisonous and can be fatal if ingested. 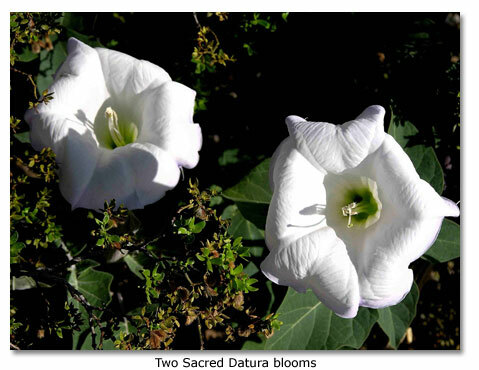 The white and lavender-tinted, trumpet-shaped bloom of the sacred datura promises a fairyland of delicate beauty, moths, butterflies, long-tongued bees, hummingbirds and magical moonlit nights. It gives rise to some of the plant’s other names, for instance, angel’s trumpet, moon lily, moon flower or belladonna (beautiful lady). By contrast, the bristly fruit and stale-smelling leaves of the sacred datura speak to another, more sinister side of the plant, to a dark and fearsome netherworld of poison and potential emotional collapse, physical sickness and even death. It suggests visions of the brooding and frightening forests of the Brothers Grimm. These parts of the plant have given rise to alternative names such as devil’s trumpet, deadly nightshade, thorn apple, mad apple, Hairy jimson weed, stink weed, green dragon and locoweed. It is as though the exquisite blossom of the sacred datura issues an irresistible invitation to a party of the spirits of darkness. Our species of sacred datura grows in the Chihuahuan, Sonoran and Mojave deserts at elevations ranging from 1000 to 6500 feet. You will often find it in sandy disturbed areas, alongside roadways and in washes. The plant is regarded as a perennial, deciduous herb by scientists. That means that it lives for at least three years. It loses its leaves in the winter. Its stems are not woody like those, for instance, of the various mesquite trees, the desert willows or the creosote bushes. Its bloom, exceptionally large for a desert plant, measures some six inches in length and three or four inches in width. Its walnut-sized, heavily spined fruit, once ripe, bursts open to scatter numerous kidney-shaped seeds. Its coarse, oval leaves, also exceptionally large for a desert plant, measure as much as six to eight inches in length. Its stems may stand several feet in height and span several feet in width. Its heavy fleshy roots serve as a storehouse for water and nutrients. Its foliage dies with the onset of winter and re-grows rapidly with the warming days of spring, drawing from its roots for energy. Like the vampires of dark fantasies, the sacred datura blooms at night, from spring well into fall. The flowers open in the early evening. They shrivel with the coming of daylight. But their scent will linger in my mind. While the plant provides nectar to several creatures in the desert food chain, it has formed a partnership called “mutualism” with the hawk moth, an insect nearly as large as your palm. The sacred datura furnishes the moth with nectar as a food source and shelter for its eggs. Unselfishly, it serves leafy meals to the moth’s hungry larvae, so much, in fact, that it must draw down on the store of energy in its roots if it is to re-grow its leaves and survive the foraging. What does the plant get in return for this arrangement of mutualism? Pollination. Its male pollen is transferred by the moth to female flower parts, enabling fertilization to take place. 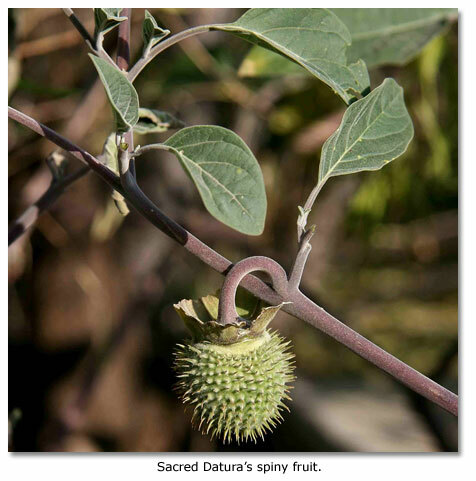 The sacred datura can then produce fruit and seeds and new generations. The sacred datura, through its night-blooming flowers, evokes a feeling of mystery, and it has long been used as a portal to the spirit world, visions, hallucinations and witchcraft  dangerously so. With all of its tissues containing chemical compounds known as “alkaloids,” the plant is extremely poisonous, with the concentration of toxic levels varying from plant to plant. Having served as a food source for the hawk moth, it even invests that insect with poisons to discourage would-be predators. 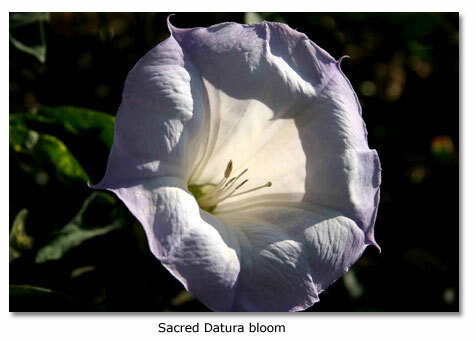 Despite the grave risks, sacred datura has been used since ancient times by spiritualists, holy men, medicine men, witches and even modern recreational drug users. It may, said one source, spawn “deep inner visionary states,” but it may also leave a person “feeling like an alien” or “feeling as if your being is dissolving.” It may cause a “fear of losing control or of insanity.” It makes you dream, even when awake. It makes you imagine that you’re seeing three dimensional objects that, in reality, don’t exist. Various sacred datura species have for eons been used in the East Indies, Greece, the Arabian countries, Asian countries, China, India and the Americas by mystics and sorcerers in a reach for otherworldly hallucinations. 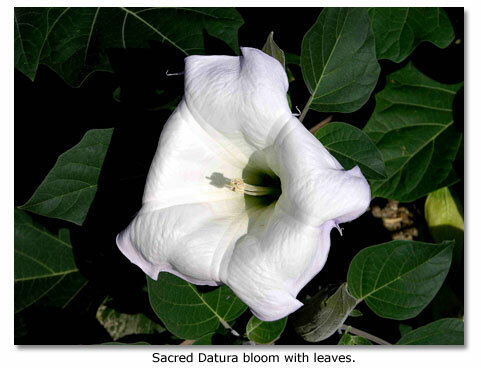 Sacred datura has played an important role as a medicine among the Indians of the desert, according to Furst. For instance, it was made into a paste or ointment by the Zunis for use as a “pain killer in setting broken or dislocated bones, alleviating localized pain, and even relieving toothache.” The plant could also, however, lead to problems such as mental disorientation, physical disabilities and heart attack. The sacred datura is a grim fairy tale. This stout, branched, sprawling perennial has long, gray-green, ovate leaves up to 6 inches long, which are covered by tiny smooth hairs. It may grow up to 2 feet high. Thorny, globose, walnut-sized fruit (1-1/2 inches in diameter) has many small, slender spines. The fruit hangs down in all species except jimson weed. Datura is a member of the potato (Solanaceae) family, also called the deadly nightshade family. There are several species of the datura genus, including D. wrightii, commonly referred to as the southwestern thorn aApple. D. stramonium is usually called jimson weed; D. metaloides is colloquially named sacred datura; and D. inoxia is usually referred to as toloache. The smaller annual, D. discolor, is often called moon flower. It grows only 18 inches high and has a purple throat not found in other species. All four deserts of the American Southwest from Baja and Southern California, east to Texas and Mexico and north through Arizona, New Mexico, Utah and Nevada. Desert sandy flats, arroyos and plains from sea level to an elevation up to 2,500 feet. Often seen along Southwestern roadsides. Large, white, trumpet-shaped flowers bloom March through November. Corollas are up to 6 inches long, have 5 teeth and are often tinged with purple or lavender around the margins. This flower opens after dusk and closes by mid-morning of the following day. All species of datura have long been used by native peoples of the Southwest in puberty and other ceremonies because of the plant's hallucinogenic alkaloids. People trying to imitate Native American ways have often poisoned themselves, sometimes fatally.